As one of the most reputable brands in Kenya and across the globe, the 22bet sportsbook provider knows its user base inside out. The operators make every effort to cater to the wants of every player, whether you’re a sports bettor looking fun or a die-hard of slot machines. Since back in 2007, the house has made strides to edge out its competition by constantly striving to improve the quality of their services. With a player-friendly ‘customer first’ approach, 22Bet sportsbook has an easy-to-use website and a large array of services that will get you giddy with excitement from the word go. If you’re hungry for more betting cash upon registration, there’s a fine bonus currently available in the 22Bet sportsbook for new players. Right after you sign up for an account, you’ll be eligible to claim the 22Bet 100% welcome bonus that could earn you up to Ksh 15,000 in bonus money. And In addition to the 22Bet bonus for new members, you’ll also receive 22 Bet points as part of the welcome package. Players must meet a 5x wagering requirement. Qualifying wagers must be trebles with no less than three selections. Odds of the qualifying wagers must be 1.40 or higher. Mind you; these are just but a few of the terms and conditions. You can take a complete look at all the 22Bet bonus requirements from the official website. This is of great importance since you’ll not be able to cash out your winnings before fulfilling all the necessary terms. Apart from the 22Bet bonus for new players, there are a couple of other deals which come and go in the lobby. As we speak, for instance, Kenyan sports lovers can enjoy a Friday reload promotion, where a 40% bonus reward up to €50, awaits you. 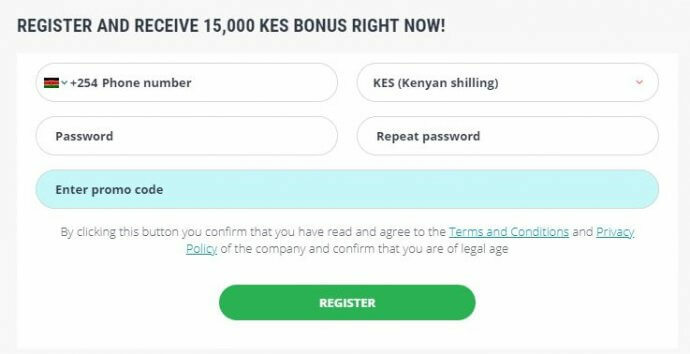 Just make sure that you read the terms and conditions of the promotion to understand what you must do on your part to grab the deal. 22Bet offers Kenyans a wide variety of sports events that they can relish in a remarkably user-friendly platform. Among all the covered sports in this lobby, football is unquestionably the best-covered event. Other than local competitions such as the Kenyan Premier League and the Kenya National Super League, you’ll find coverage of popular global leagues such as EPL, Spanish La Liga, German Bundesliga, Italian Serie A, and French League One. Other additional sports events that you can also enjoy betting on include basketball, handball, darts, tennis, ice hockey, golf, boxing, rugby, and numerous other games. So, in case you aren’t much into football, there are plenty of other sports that you can enjoy betting on. Almost all the sports events offered at 22Bet come with several market picks. These comprise of the 3-way betting (1X2), Overs and Unders, Total Number of Goals, Next Team to Score, No Team to Score, Both Teams to Score, and Handicap. The odds offered at 22Bet are quite across all the sports events. For a larger part of the games, the odds average roughly 1.75. This is particularly in major sports events such as football. When making wagers on unique markets such as ‘next team to score,’ ‘a given player to score,’ or handicap the odds even get better. Compared to many other sportsbooks in Kenya, 22Bet offers solid odds across all events and locals are assured of bagging substantial payouts with every winning wager. The user-friendliness of this gaming platform makes it a superb platform for Kenyans to back their favorite sports teams. With 22Bet you can enjoy placing wagers on a large range of sports either via the downloadable version (mobile app) or the instant play/no-download version. On both the desktop and mobile platforms, the interface is intuitive, and you can easily switch from one section of the bookie to another without any hassle. You’ll also be interested to know that the content of the mobile app is just similar to that of the web version. Thus, if you decide to bet on the go, you won’t miss out on anything. And by the way, the downloadable version of the site is compatible with iOS and Android devices. Android users can easily download the native app directly from the 22Bet website while iOS users can get the application from the iTunes App Store. If you want to see what is new with other bookies in Kenya, we recommend visiting Bet9ja, Betin and Sportpesa. 22Bet offers Kenyans a plethora of payment options for making deposits and withdrawals. The banking options available at 22Bet comprises of mobile payments, bank wire transfer, e-wallets, prepaid cards, and even digital currencies popularly known as cryptocurrency. Whether you want to load or cash out, you’ll always find a fast and convenient option at your disposal. In case you have any questions about the 22Bet bonus or any other query, then you’ll be happy to know that support services are available via email services and a live chat channel. While emails are answered within 24 hours, live chat responses come in an instant. For sure, 22Bet is one of those sportsbooks that boast of excellence and can back it up with top tier services. Become a member today, and a 22Bet bonus worth 100% up to Ksh 15,000 is yours for the taking, and you can enjoy it across countless tournaments locally and on a global scale. If you are truly looking for an online sportsbook that has everything from high-end sports betting solutions to eSports and a live betting client all under one roof, then 22Bet is your best choice.